In February 2017, ZAMine Service Chile ("ZAC") completed Chile’s first supply of three mining hydraulic shovels manufactured by Hitachi Construction Machinery. ZAC is the fourth company of Product Support Company, a type of dealership dedicated for mining machineries, owned and operated by Marubeni, following three in Mongolia, Peru and Colombia. 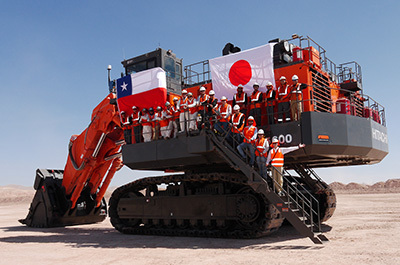 Since 2014, ZAC has developed from a green-field business and has utilized Marubeni’s presence together with its Product Support know-how in other countries to establish a foothold in the Chilean market (in which Hitachi Construction Machinery was unable to enter). Hitachi Construction Machinery has developed and manufactured mining hydraulic shovels with its own technological know-how for 38 years and currently boasts the top share in the 200 ton + class. In recent years, Hitachi Construction Machinery has also manufactured mining dump trucks through joint development with Hitachi Ltd and is growing its market share. 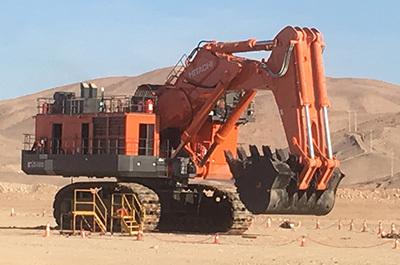 ZAC's strategy is to surpass the competition through the supply and ensuing Product Support of these hydraulic shovels by achieving customer satisfaction and brand penetration in the Chilean mining machinery market which is the largest in South America.